Niantic recently closed its second Pokemon Go Community Day event, and now, it has shared details of the third one. The third event is scheduled for March 25 and will run for three hours. According to Niantic, the Pokemon Go Community Day event will feature one of the original three starting Pokemon from Red and Blue. Similar to the earlier events, the third one will also allow players to catch a rare Pokemon, which knows a special move. Though the game maker hasn’t revealed the special move, the rare Pokemon will be the Grass-type starter Bulbasaur. Many, however, may be disappointed with the Bulbasaur (that ultimately evolves into Venusaur) considering the rare Pokemon’s in the previous two events. Forbes’ Paul Tassi even refers to it as a “boring pick” for the Community Day. Further, players will get a chance to earn triple XP if they catch the Pokemon during the event hours. Timing details for the event is as follows: Europe, Middle East, Africa, India: 10 am to 1 pm UK or GMT, 11 am to 2 pm CET; Asia Pacific: 12 pm to 3 pm JST; North America, South America and Greenland: 11 am to 2 pm PST, 2 pm to 5 pm EST. Though Niantic has not yet confirmed, there are talks that a shiny Bulbasaur could debut as part of the event. The event will feature three-hour Lures. More details about the event will be revealed later. 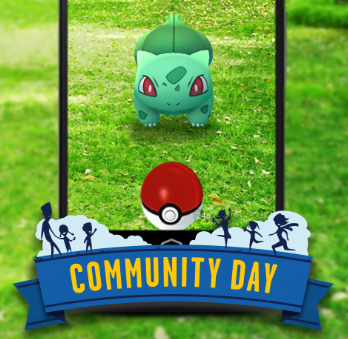 Pokemon Go Community Day events are aimed at encouraging players to go out and play together for set hours. Niantic is hoping that such events add to the “excitement of local events and meetups” and give players a chance to enjoy the game with their friends and possibly make new friends in the process. “Pokémon GO Community Day is an opportunity for Trainers around the world to meet up at their local parks to make new friends and experience what it means to be a part of this special community,” the developer says. The last Pokemon Go Community Day was on Feb. 24. It featured everyone’s favorite base-level Gen 1 dragon-type: Dratini. Further, the event offered 3x Stardust on a Pokemon caught in the wild, Shiny Dratini family, and the ability to evolve a Dragonite with Draco Meteor. Separately, the Jan. 20 event featured Pikachu with the unique Surf move. The event also offered three-hour lures, increased chances to catch the Shiny Pikachu and double XP. Apart from boosting the popularity of the game, such events also contribute to the overall success of the Pokemon franchise. A recent update from the Pokemon Company suggests that other aspects of their business (apart from games – Pokémon Ultra Sun and Ultra Moon on 3DS and Pokémon GO on mobile) are performing well in Europe. In Europe, the Pokemon is the top trading card game accounting for 82% share of the market last year. The card game is performing well in other regions as well, for instance, its UK growth rate is 42%, 56% in Spain and a phenomenal 644% in Italy. In addition, Pokemon toy sales is witnessing an impressive growth rate as well – 146% in Italy, 54% in the UK, and 14% in Germany, according to Nintendolife. “2017 was another exceptional year for the Pokémon Trading Card Game. We are the number one Strategic Card Game in Europe, and the UK toy industry voted the Pokémon Trading Card Game the top Pocket Money Toy of the Year,” said VP of Pokemon TCG Sales Europe, Simon Benton.